The Ultra Aire 90H Dehumidifier is a larger capacity unit for whole house use in areas of up to 2,200 sq ft (manufacturer's recommendation). This unit has a water extraction rate of 90 pints per day and exceptional energy efficiency. Wherever the dehumidifier is installed its benefits reach the whole house using either independent or existing HVAC ducting. The Ultra Aire 90H Whole House Dehumidifier is an Energy Star qualified appliance and is among the most energy efficient in its class. The energy factor of this unit is 2.50 litres of water per kilowatt hour which is substantially better than room dehumidifiers, of which more than one would be needed to undertake the job it can do alone. The main reason for this is that the 90H uses the air that has been cooled and dried by the unit to pre-cool the incoming air drawn from the room. This re-use of energy lowers the amount of additional energy needed to condense water vapour from the incoming air and contributes significantly to the overall energy efficiency of the dehumidifier. This unit is designed to fit into small spaces and measures only 15.75"x20.875x34.5" making it very compact for a dehumidifier of its water extraction capacity. If the most convenient site for this unit is in a crawl space its small size will ensure that this dehumidifier will fit comfortably. The unit is designed to reach all parts of the home by means of a ducted installation which can take advantage of existing HVAC duct-work or can be installed with its own dedicated ducting. This dehumidifier is supplied through licensed contractors who will also undertake installation in accordance with Therma-Stor standards. 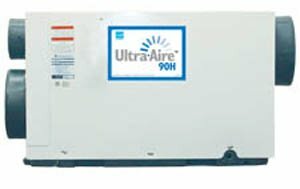 The Ultra Aire 90H Dehumidifier can be located in crawlspaces and basements not only because of it neat, economical design but also because it is engineered for low temperature operation because it is fitted with an auto-defrost system. Most dehumidifiers used in the home have refrigeration coils, very similar to those found in a refrigerator. They are cooled to low temperature in order to condense water vapour from the air, a process which is at the heart of the unit. Because they are so cold ice will form on the coils at temperatures from 65°F downward and the dehumidifier then has to stop working until the ice melts. Auto-defrost speeds up the thawing process and enables the dehumidifier to operate effectively at lower temperatures, in the case of the 90H, down to 56°F. Crawlspaces and basements are typically cooler than the rest of the house, simply because warm air rises and is replaced by cooler air. The auto-defrost feature counters the effect of this and as a result a purpose-built whole house dehumidifier such as the Ultra Aire 90H can be located in one of the most convenient places in the home. The Ultra Aire 90H Dehumidifier can also improve air quality in ways other than simple dehumidification. As an option the unit can be configured to draw fresh air from outside the home to dilute pollutants and refresh the oxygen supply inside the house. The amount of additional ventilation can be regulated using the controls designed for this purpose. All dehumidifiers have air filters to protect the unit from particles in the air but the 90H offers a MERV 11 filter as standard which removes smaller particles, including many mold spores. This can be improved to MERV 14 by the purchase of an up-graded filter housing available as an optional extra. Other features of the Ultra Aire 90H include a humidistat to regulate the moisture content of the air. This ensures that the unit operates only when the relative humidity rises above the pre-set level and saves energy. Simple controls make the unit easy to operate and a remote sensor is available at an extra charge. The dehumidifier is equipped for continuous drainage which allows the condensate to be discharged to a nearby drain or other outlet by means of a plastic hose. If the nearest outlet is at a level higher than the unit's location a condensate pump is available to force the water up to the next floor of the house. Dehumidifiers in this class are, inevitably, considerably more expensive than a room dehumidifier. Off-setting this are its energy efficiency, the expectation of a longer service life and the provision of a five year warranty and the likelihood that more than one room dehumidifier would be needed to dehumidify an entire house.